Mini Chalkboard Panel is a mechanical assembly of panel, chalkboard, and panel brackets. Panel is 0.75” (19mm) bi-color sheet polyethylene. 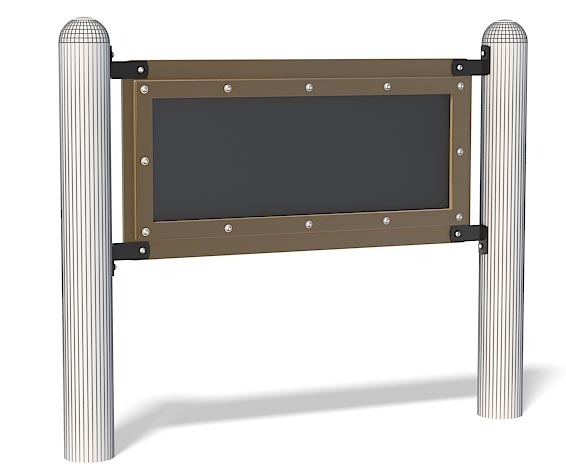 Chalkboard is 14 gauge (2mm) satin-coated steel sheet. Chalkboard is painted with scratch-resistant black chalkboard paint. Panel brackets are 10 gauge (3mm) satin-coated steel sheet. Panel brackets are powder-coat painted.